Merry Christmas to those of you who celebrate. This year was extra special for me since it was the first year I hosted Christmas Eve dinner in our new house. You might remember last year our home was under renovations and I wasn't able to invite my family over. 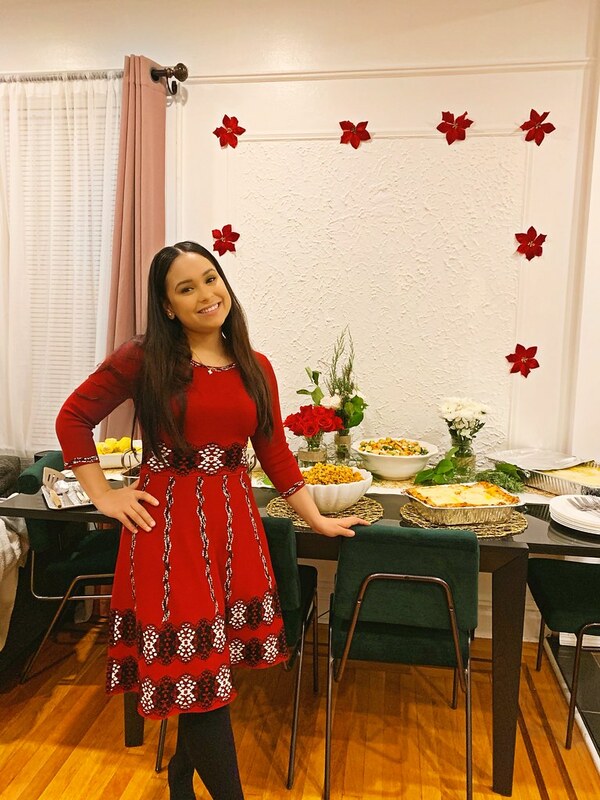 Ever since I was a little girl I always dreamed of hosting Thanksgiving and Christmas dinner and this year I finally did. This post is sponsored by adidas. As always all opinions are my own. It's the most wonderful time of the year. It's also my favorite month since it's my wedding anniversary, my dad's birthday, my birthday, and Christmas. Let's not forget it's also that time of year where we close a chapter in our lives right before opening a new one. This is the time to reflect on our mistakes, our achievements and our future goals. During this time some people like to make New Years Resolutions, I personally don't. In the past I've made really unrealistic and unachievable resolutions and it's why I stopped making them. Instead, I like to set monthly goals. This keeps me motivated and active throughout the year. Before giving birth to baby James I was 115 pounds, after birth I was 162 pounds and five months later I'm now 135 pounds. Clearly I have a long way to go in order to achieve my weight goal of 120 pounds but I'm working on it little by little. One thing I recently tried was meal prepping. This is something I've heard so many people talk about and they say it works wonders. I didn't believe it until I tried it. Now, I don't have a scale and I don't weigh the food but I do portion things out and I do use lots of vegetables as well as lean meats. Here's what I would do; I choose one day of the week to cook a few different healthy dishes which I eat throughout the week. This for me was a game changer. Not only is this a huge time saver but it's also helped me avoid ordering takeout which is my biggest problem. & yes, it's true the I haven't 100% stuck to this routine 7 days a week but I also try not to be too hard myself and give myself a few days off the routine. I'm hoping that the longer I meal prep, the better I get at training my body to make healthier choices. Today I'm going to share one of my absolute favorite recipes to make in a jiffy. This is something I used to make for my family even before I started meal prepping. The only difference is the portion control and side dishes may vary. So I decided to do Vlogmas this year and I'm super excited about it as it will allow me to get a little more comfortable with the camera. That's one of my new years resolution: not to be afraid of the camera. As many of you know, I've been blogging for 7 years now and still have a little fear of being on camera. I feel that vlogging throughout the month of December will enable me to loose that fear come 2019. It would mean the world to us if you would LIKE and Subscribe to our channel here and here. ALL MATERIAL © 2013 - 2018 NYTRENDYMOMS. Powered by Blogger.